This is a scarce 1874 map of Israel, Palestine or the Holy Land with surrounding regions by Ambroise Tardieu. Essentially four maps on a single sheet, the maps depict the geography of the Bible. The first map, on the top right quadrant depicts the Promised Land of Canaan and the travels of the Israelites. It shows the course of the Israelites as they fled out of Egypt, across the Red Sea, and subsequently spent the next forty years wandering in the Sinai before migrating into the Promised Land by crossing the Jordan River just north of the Dead Sea. The second map, on the left of the sheet depicts Palestine, Israel and The West Bank region. The third map in the top center is of the Herodian Kingdom and the villages visited by Jesus Christ. The map on the bottom right depicts the travels of the apostles St. Paul and St. Peter. 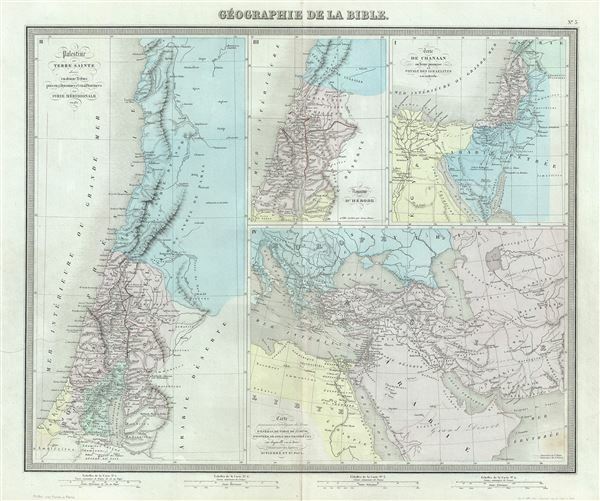 This map was prepared by Ambroise Tardieu and issued as plate 3 in his 1874 edition of Atlas Universel de Geographie Ancienne et Moderne.